RoboCup 2014 wrapped up in João Pesso, Brasil, last week, and the scientists, info technology experts and engineers whose bots participated have been sharing their secrets with each other since the whistle blew on the last match. In “Humans 1, Machines 7,” The Economist reported more than 150 teams participated in the event, which featured competition in a wide range of futbol-bot categories, from miniatures to humanoids. These bots are good, and they’re getting better. Hold up. Basic news, sure. Formulaic press releases, OK. Pulitzer Prize? That seems like a stretch. Two of my passions are soccer and writing. A.I. 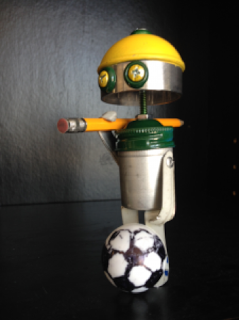 is cool, these robots blow my mind, and I’d love to see bots saving goals and writing news updates for myself. I also have no doubt the discipline’s pioneers will continue to refine robots’ ability to duplicate the basic mechanics of people. But in my view the nuances, creativity and limitations of individuals are the genius of soccer, writing and other human activities. So far, no one is suggesting robots will be replacing the likes of John Steinbeck or Cristiano Ronaldo, but A.I. marches on. And in more and more instances, it dribbles and scribbles, too. Next Next post: No tight pants. How about NO victim blaming, instead?